An Analysis of the Determinants of Occupational Upgrading presents a study that focuses on occupational mobility as a proxy measure for job upgrading. This monograph was first prepared in 1975 as a final report to the Manpower Administration of the U.S. Department of Labor. It is the second monograph of the Institute for Research on Poverty to deal with black-white income differentials and is also part of a growing Institute literature on the dual labor market theories and occupational mobility. The book contains seven chapters and begins with an overview of occupational mobility in the United States. The next chapter considers previous attempts to test the dual labor market hypothesis and presents a model of occupational mobility to be used in testing five hypotheses on the determinants of occupational upgrading. 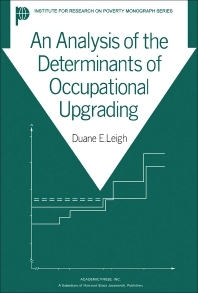 Subsequent chapters discuss the Census and NLS samples and outline the empirical variables used to measure the variables specified in the model; the impact on occupational upgrading of formal vocational training, industry structure, and job tenure; and the impact of interfirm and interindustry mobility on occupational progression. The final chapter summarizes the empirical findings with respect to each of the five testable hypotheses and considers some policy conclusions drawn from the analysis.